Upon arriving at Jeremy Corbyn's rally in sunny Stoke-on-Trent earlier, we were immediately accosted by "the BBC". Funnily enough, they were recording something about crowd behaviour for a programme on Radio 4 (can they not get enough of me? ), and so asked questions about why people come to rallies, their importance and perception "from the outside", the "threat" they pose, and about Jeremy Corbyn himself. Among other things, I told them that Jeremy was going to take his place atop the FBU's fire engine and say very simple, uncontroversial things about supporting disabled people and building houses. And the fact that's considered radical just goes to show how remote "established" politics has become from everyday concerns. Perhaps it's because Jeremy was speaking on my Stokie home turf, perhaps it's because of the many, many labour movement events I've been to where, this is the first the public turned up to. Perhaps because I know the guts that were busted by local Red Labour comrades to get Jeremy to Stoke and organise the event at short notice, and perhaps because Jeremy, in my opinion, spoke better here than he did at Derby. Whatever the reason, I thought today's rally was excellent. Presided over by Cllr Ruth Rosenau, we heard from the CWU's Max Penkethman, Andy Fox-Hewitt of the FBU, local FE student Shakira Rosenau (at her first public speaking engagement! ), Unite Community's Clare White, and Unison's Roger McKenzie. They warmed the crowd up with attacks on the Tories (remember them? ), the importance of trade unionism, and a vision of a different, better Britain. And then came Jeremy himself. Seeming quite relaxed, he, as on every previous occasion I've seen him speak, simply set out his stall. This is one leg of his appeal. He is able to make the case for left wing politics in plain speaking, unspun language. He mentioned Thatcher, which drew a round of boos, but that's the nearest he got to making a direct political attack on a personality. He talked about the party's achievement of resisting Tory cuts policies in Parliament, and criticised the beggar-thy-neighbour commonsense happily aired by too many mainstream politicians in all parties. As he noted, you can blame convenient scapegoats for housing shortages, NHS queues, and inadequate school places, but all that sound and fury won't lay a single brick, employ an extra nurse, or take on another teacher. The National Education Service idea got another airing, as did the need to take mental health issues more seriously, the banning of zero hour contracts, and providing cultural and artistic opportunities for those denied them. No mention of the MPs who would have deposed him, and no mention of Owen Smith. Almost as if Jez had read my write up of his Derby visit, he avoided the acronyms beloved of lefty meetings. And, yes, he did invite everyone present to join. "We want to include everyone", he said. Very good. Apart from the politics, there were two happenstances that demonstrates why, for so many, Jeremy is something of a new wind. Before the rally kicked off, a couple of blokes had come down from Bolton for the day to busk around the city centre without knowing what was due to happen. Rather than being moved on, these guys were invited onto the fire truck, and ended up playing warm up for the audience of hundreds. The second was after. Jeremy came down and spent a good 45 minutes talking to the crowd who came for a word or a selfie. He talked footy with a Liverpool fan, had a photo with Stokie hero Nello of Marvellous fame, talked politics with a guy who'd been in and out of the YMCA, and much more. It's this that's key. When politicians are typically perceived as uncaring and remote, Jeremy tears up his schedule (much to the frustration of his assistants) and listens to the concerns and complaints of ordinary folk. And, more often than not, this is what people who are interested in politics but are at turns disenchanted and alienated need. They want to say their bit and be heard. 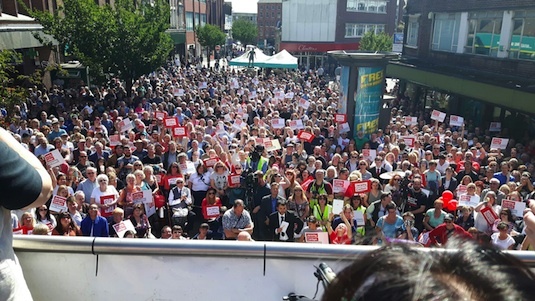 In all, this was the biggest labour movement event in Stoke for some years - certainly since 2,500 marched through the city centre in defence of the local hospital just over a decade ago. Again, like Derby, for a workday lunch time the turnout was fantastic, and doubly so for a city formerly better known for the racist and parochial politics of the councillors it has returned. The crowd was a good mix of ages and genders, and, I think, there was a sense of hope and excitement in the air that seldom attends political events in Stoke. An excellent rally then, and one I hope will energise a further wave of new members and party supporters for the North Staffordshire CLPs. Great Rally.Fantastic Turnout.No matter how they attack him,his support grows&grows.He's a decent,honest, sincere man&will make a Great PM!!! J.Corbyn is in Glasgow (again) this month. Invited by the Jimmy Reid Foundation and speaking in Govan a stone's throw from the old Upper Clyde Shipbuilding yard, now BAE, where Jimmy made history. "I didn't leave Labour. Labour left me" said Jimmy. He crossed over to the SNP which he saw as the only viable social democratic party. Labour stood with the Tories against Scottish self determination.Once again I say Labour stood with the Tories as a Unionist block. Corbyn is favourable to Palestinian self determination etc. Even for a re-unified Ireland, but not for an Independent Scotland. Nor for the removal of Trident anchored on the boundary of Glasgow. He is flawed in Scotland as is Labour's Scottish Branch Office at Holyrood and Labour Councils. Jimmy's ghost might show up for the Govan lecture by Corbyn , but it could be a heckling spectre hooing "where are the promised frigates"
Jimmy was never Labour, the sit in stifled the call for direct action that was not bubbling but boiling over throughout Scotland, from Dundee to the Vale and across the Clyde in the Port and Greenock. Not only was the sit in a defeat for the UCS as the CPGB stewards signed up to 3000 job losses, no strikes and a 120% increase in productivity at the insistence of the new American bosses. The situation was electric throughout the Clyde area, the switched off the power. It was at that time the CPGB, taking an internal Scottish Turn, decided to promote Scottish Nationalism, and again it was about control. Jimmy Reid never left the Comintern, the Comintern left Jimmy. If Jeremy is not going to be a blip in Labour's inevitable ride to being an establishment party then he must but must ensure that at least 90% of the PLP are behind him and the party and he must be must ensure that anyone who thinks anything to the left of Thatcher is idealism never gets a position of power in the Labour party. If he fails to do this then the PLP will simply ensure a Blairite wins the next leadership contest and the transformation of Labour will end forever once Corbyn steps aside. If Corbyn has no plans to ensure the Blairites are removed he may as well go now and stop wasting all our time. The true enemy of progress are the centre left, who believe tackling inequality, racism, imperialism etc is idiotic idealism. At the same time the centre left have this incredible self conceit that everything they believe is unequivocally the absolute truth and anything that challenges their world view is idealism and cannot be tolerated. They live in a world of absolute moral certainty. They are every bit as fundamentalist as the Islamists are. I mean it isn't as if their world view hasn't brought the planet to the brink of disaster! Surely it is idealism to think things can just carry on the same forever! Hashtag: THE CENTRE LEFT ARE THE ENEMY AND ARE NOT AS CLEVER AS THEY THINK THEY ARE. Jeremy was in Ramsgate Kent yesterday. Great turn out of around 2,500-3,000 people. You have just summarised my feelings and what I heard. Never once did he attack another person or politician. Plain, simple policies laid out.